Amidst the plethora of flawed, implausible, and wasteful research on acupuncture and Chinese medicine, a 2002 study on the “Relationship of Acupuncture Points and Meridians to Connective Tissue Planes” stands out as the height of factual neglect. In it, Helene Langevin and Jason Yandow of the University of Vermont’s College of Medicine claim to have matched real anatomical structures with the elusive acupuncture “meridians.” It should be noted that the widely accepted term “meridian” is a metaphor coined by George Soulié de Morant (1878 – 1955), a French delegate to China, and has no semantic relationship with the original Chinese word.2 The original designation is the composite word jing luo (經絡), which literally means “channel-network.” The term has been translated to English as chinglo channels, channels, vessels or more commonly, meridians. Debunking this study is of particular relevance because it is often used by acupuncturists and a wide range of other CAM providers to legitimize the meridian lore. The principle author, Helene Langevin, is a CAM celebrity and a member of the “Scientific Committee” of the International Fascia Research Congress, an organization dedicated to the “emerging field of Fascia Studies.” She is an Associate Professor of Neurology and the Director of the Program in Integrative Health at the University of Vermont; and has conducted multiple NCCAM-funded studies on the role of connective tissue in chronic pain, acupuncture and manual therapies. The elusive and mysterious meridian system seems therefore to be nothing more than a rudimentary and prescientific model of blood vessels and nerves. Langevin and Yandow’s conceptual model can thus be seen as historically unfounded. It is also implausible because postulating an anatomically precise “medical gaze” for ancient and medieval physicians is anachronistic. As one reader (Dr. Le Petomaneon) pertinently commented on my previous post, The Cargo Cult of Acupuncture, this postulation “begs the question of how preindustrial Chinese researchers could have created an accurate map of meridians without the advanced technology it has taken for anyone to have a remotely credible claim to have detected them.” In fact, as Michel Foucault (1926-1984) has pointed out, it is only in 18th-century Europe that the body became something that could be mapped with precision.5 For millennia prior to that, anatomical structures that lay below the threshold of the visible were conceptualized according to mythology, astrology, and other figments of the imagination. Consider, for instance, the 17th-century medical manuscript by Yang Jizhou (杨继洲) called the Zhenjiu Dacheng (针灸大成), where the medical and astrological narratives are inseparable. This work, which is incorrectly translated as the Great Compendium of Acupuncture and Moxibustion , describes a medical gaze that is not directed towards the body and its anatomy, but towards the Heavens and astrology.6 The Zhenjiu Dacheng and other prescientific manuals of medicine in China are not exploratory guides about the fascial planes or other anatomical structures; they are manuals of medical astrology. This is why the original designations of the principal meridians (e.g., tae yang, jue yin) represent the angular position (hour angle) of the Sun (Table 1), and not the “physiological functions thought to be speciﬁcally related to each,” as Langevin and Yandow inaccurately state. The historian Paul Buell has argued that even the Yellow Emperor’s Inner Canon (黄帝内经, Huangdi Neijing, 400-200 BC), the formative book of Chinese medicine, is as much an astrological compendium as a medical text. Image 1. 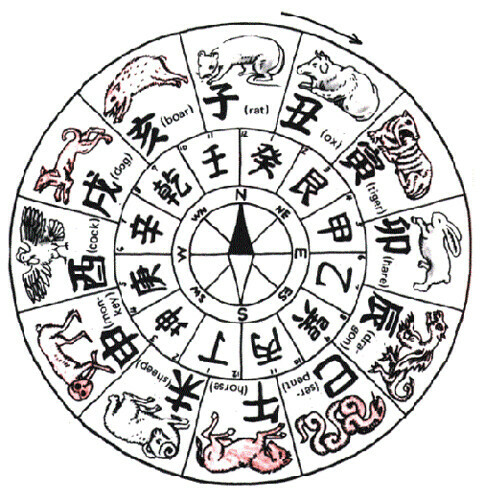 The Chinese zodiac system called Stem-Branch (干支 gānzhī). The closed loop formed by the meridian network mimics the circular nature of the zodiac system. Image source: Facts and Details about China and Japan. Table 1. 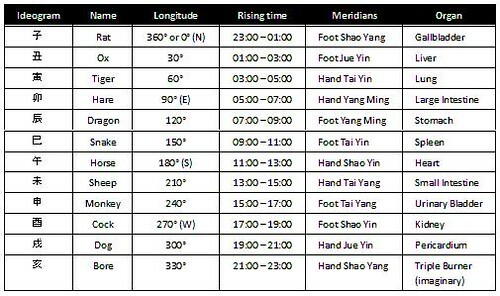 Chart depicting an astrological relationship between the 12 main meridians, the 12 main organs, and the constellations of the Chinese zodiac system.7 Each meridians is named after a solar hour-angle (meaning the position of the Sun on the Ecliptic), and corresponds to a 2-hour time division of the Celestial Equator. 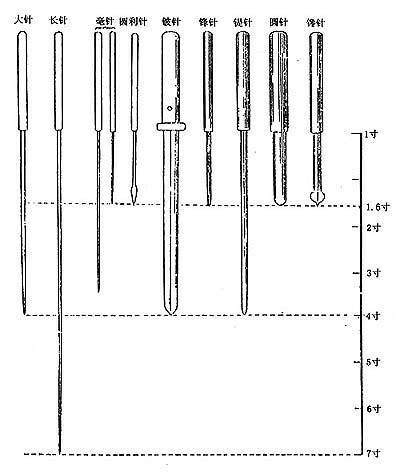 Also, historical facts do not supports Langevin and Yandow’s assertion that “during acupuncture treatments, fine needles traditionally are inserted at specific locations of the body known as acupuncture points.” The instruments described in the Inner Canon are mostly pins, lancets, fleams and bodkins; not fine needles. Besides, the ideogram zhēn (针), which has been mistranslated as “needle,” actually means any instrument of puncture, incision or penetration, such as a pin, lancet, needle or any other sharp device. 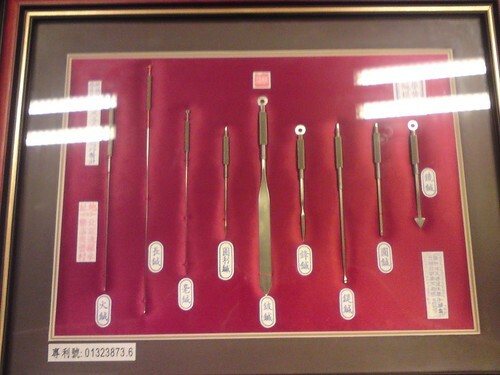 In the Inner Canon, the term mostly refers to lancing and bloodletting, not acupuncture (as we define it today), particularly in a section called Simple Questions (素問, Su wen).8 Of the nine sharp instruments described in the the Inner Canon (Images 2-4), only three resemble coarse needles and pins.9 Some of these instruments significantly resemble the instruments of bloodletting and surgery found in medieval Europe (image 5). In fact, most of the traditional reference material that is currently associated with acupuncture and meridians is actually about a variety of methods and instruments to incise structures that share their paths, contents, and focus of treatment with the Greek notion of phlebes (blood vessels in general). If the current map of acupuncture points and meridians is distinct from the vasculature, it is because in the early 1930s the pediatrician Cheng Dan’an (承淡安, 1899-1957) resurrected and rehabilitated the vanishing street trade of therapeutic piercing by moving the treatment loci away from the blood vessels. He illustrated his revisions by painting the new pathways onto the skin of individuals and then photographing them. He also replaced the coarse medieval tools with the fine needles we associate with acupuncture today.10 It is the reproduction of these new pathways in modern acupuncture textbooks, and the new use of fine needles that Langevin and Yandow have unknowingly taken for historical facts. Image 2. 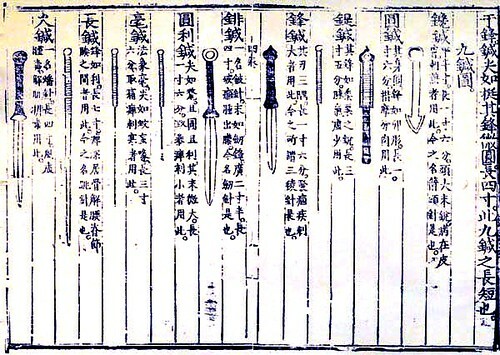 The nine tools described in the Inner Cannon are fund in medical manuscripts throughout the history of China. Image source unknown. Image 4. Reproduction of the nine tools. They do not look like “fine needles” to penetrate the fascial planes. Image source unknown. Image 5. Reproduction of European medieval bloodletting and cautery tools based on archaeological finds at the abbey of Saint Eutizio, Italy. 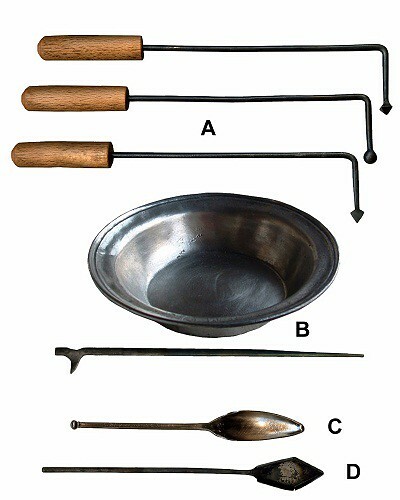 Legend: A. Cautery irons, 35 cm; B. Fleam & bowl, 28 cm; C. Medical spoon, 14 cm; D. Bodkin to remove arrows, 20 cm. Image source: Medieval Design. According to the Center for Inquiry, the 2010 budget of the National Center for Complementary and Alternative Medicine (NCCAM) is $128.8 million – more than 60 times greater than its $2 million budget in 1992. The budget of the Office of Cancer Complementary and Alternative Medicine (OCCAM) was $121 million in 2008, and is presumably higher in 2010. Together, these funds amount to $240 million of taxpayer dollars, without counting the money these institutions have received from the government’s stimulus packages. Yet, not a single publicly funded research project has shown that a CAM modality is significantly beneficial for anything. Some of these projects are scientifically flawed, others (like the one discussed here) are based on inaccurate assumptions and factual neglect. The laissez-faire attitude at NCCAM and OCCAM, and their leadership’s ignorance of historical and epistemological facts about the projects they fund, are certainly responsible for this deplorable situation. As a result, not only millions of taxpayer dollars are being spent on seemingly ridiculous research projects, but also the very fact that they are supporting these projects is often used to lend an appearance of legitimacy to treatments and ideas that are not legitimate. Furthermore, as Kimball Atwood has argued, this research grant money has resulted in the establishment of a cadre of academics who have come to rely on the federal government with little regard for the scientific issues associated with CAM research.15 Helene Langevin is certainly one of these academics. With special thanks to Kristin Koster, PhD, Paul Buell, PhD, and Paul Ingraham for their valuable comments. 1. Fontenelle BB (Author), Bergier J (Editor). Fontenelle: Entretiens sur la Pluralité des Mondes suivi de Histoire des Oracles. Marabout Université. 1973. 2. Kendall DE. Dao of Chinese Medicine: Understanding an Ancient Healing Art. Oxford University Press, USA; 1 edition. 2002. 3. Langevin HM, Yandow JA. Relationship of Acupuncture Points and Meridians to Connective Tissue Planes. Anat Rec. 2002 Dec 15;269(6):257-65. 4. Craik EM. Hippocratic Bodily “Channels” and Oriental Parallels. Med Hist. 2009 January; 53(1): 105–116. 5. Foucault M. The Birth of the Clinic: An Archaeology of Medical Perception. Vintage. 1994. 6. Wilcox L (Translator). The Great Compendium of Acupuncture and Moxibustion. vol. V. The Chinese Medicine Database. 2010. 7. Maciocia G. The Foundations of Chinese Medicine: A Comprehensive Text for Acupuncturists and Herbalists. Second Edition. Churchill Livingstone. 2005. 8. Unschuld PU. Huang Di Nei Jing Su Wen: Nature, Knowledge, Imagery in an Ancient Chinese Medical Text. University of California Press. 2003. 9. Dharmananda S. Bleeding Peripheral Points: An Acupuncture Technique. [Accessed 24 August 2010]. 10. Andrews BJ. History of Pain: Acupuncture and the Reinvention of Chinese Medicine. APS Bulletin. May/June 1999;9(3). 11. Anonymous. Essentials of Chinese Acupuncture. Foreign Language Press, Beijing, China.1979. 12. Moffet HH. Sham acupuncture may be as efficacious as true acupuncture: a systematic review of clinical trials. J Altern Complement Med. 2009 Mar;15(3):213-6. 13. Berman BM, Langevin HM, Witt CM, Dubner R. Acupuncture for chronic low back pain. N Engl J Med 2010 Jul 29; 363(5):454-61. 14. Slack R, Mielczarek EV. Acupuncture: A Science-Based Assessment. Special Report. A Position Paper from the Center for Inquiry’s Office of Public Policy. 10 June 2010. [Accessed 05 October 2010]. 15. Atwood K. The Ongoing Problem with the National Center for Complementary and Alternative Medicine. Skeptical Inquirer. 2003, 27(5). [Accessed 8 October 2010].